This years Garlic harvest has been quite successful. I have been growing quite a lot of test varieties the last two years to build up seed for hopefully a good sized commercial crop in the next season. Growing in two quite different locations with their own unique climates has been an interesting experience. 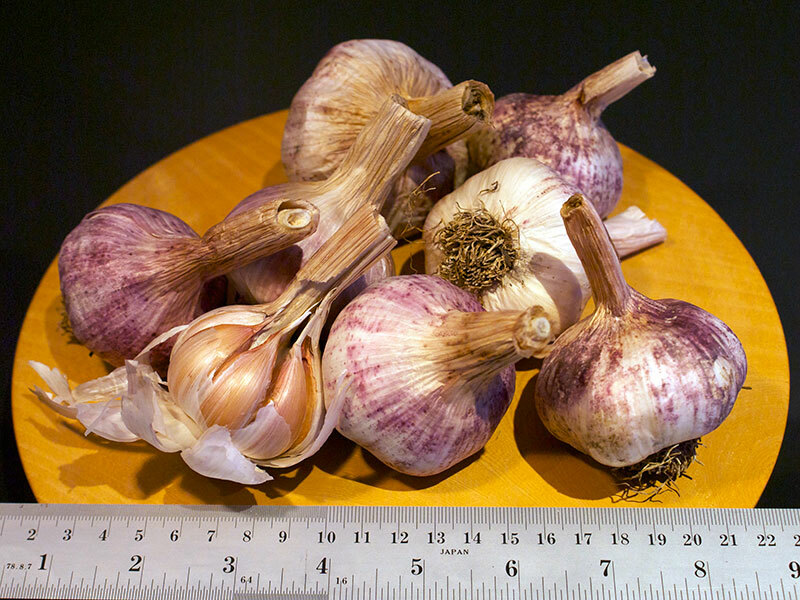 Up till recently I have really only been growing garlic to keep a collection going with only a small number of bulbs of each variety grown. But trying to grow to enable larger amounts and to also focus on best quality (and good size) makes for a complex planning process. Many of the varieties need to be planted and harvested at different times and often they can vary a great deal individually in growth and quality with unexpected and unpredictable heat, cold, rain or drought each year. There are some varieties that tend to be easier to grow in general due to their ‘flexible’ nature of growing ok in ‘hard’ or less suitable circumstances. Examples would be the Turban and Purple Stripe groups that tend to grow ok even in pretty ordinary unimproved soil and with less water that some others. They will usually produce bulbs and often even flower in pretty dire environments. However if they are treated well and grown in good soil with plenty of water and sun they usually also improve enormously in quality and size. There are some varieties that will definitely work better in each unique environment and it just takes some time to work out which are best in each case. This year these are the ones that have shown some of the better results from the range i grow. I have been growing this small purple stripe variety for a while. I don’t know what it is, but it always has quite small heads and cloves regardless of treatment and always develops nice curly flower stalks and scales even in harsh growing conditions. Despite it’s small size it has a really nice flavour and lasts well. This artichoke variety is a really strong grower and tastes great. 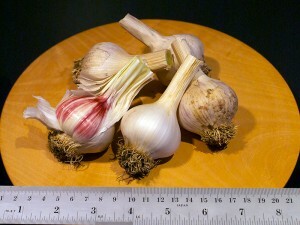 This is a truly great Creole Garlic and is a very hardy grower. The bulbs don’t seem to want to get very big and are slow to mature. They are probably the last to harvest. This is a really nice Turban and fairly easy to grow to a good size but I have found it highly variable. This was originally sourced from Brymworth Farm. This is a really nice Rocambole that is a strong growing plant that produces good sized colourful heads. 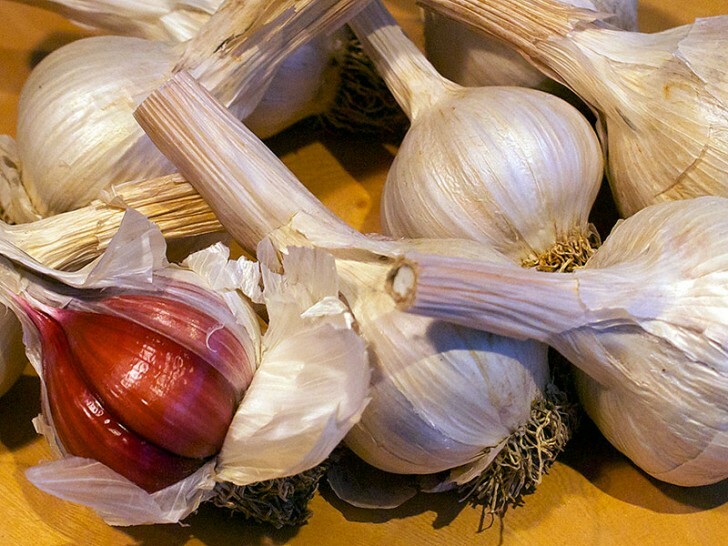 It was originally sourced from Angelica Farm. It could be another variety other than Rocambole but seems to have all of the usual traits you would expect. 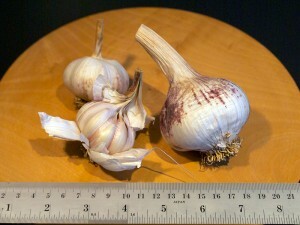 It can produce a second ring of cloves. It tastes subtle to begin with and then gets stronger and nutty on the palate. Now this is a strange little bulb that was supposed to be a Rocambole but could be something else. It is quite small and only produces a single ring of pale cloves that have a nice strong flavour. It is a slow grower and like the creoles takes ages to bulb up and mature. Monaro is a Turban variety that has a lot of the main attributes you want in a reliable producer. It does seem to respond better to a cold growing season than some other turbans. This is great spicy Turban bulb. It looks great and has some strong heat. Sometimes it is classed as an Aisatic – but I have had not had enough of the fully developed flower scapes form on them to confirm either way. This variety is one that seems very sensitive to moisture at the end of the growing season – in a negative way. 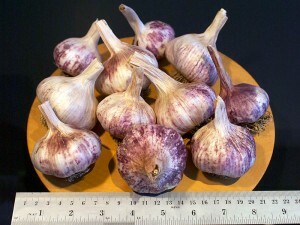 This is another variety like Shandong but more rounded in flavour and variable in overall size. And also it seems very sensitive to wet weather near the end of the growing season. This variety is such a strong grower!! the plants are really quite big and they form well shaped and easy to eat heads. This is the one selected and grown by Patrice Newell in the NSW Hunter Valley. I can never seem to get them to be a large as the ones she sells, but they are always nice heads. This variety was one I got some time ago randomly in a Garlic plait from a supermarket sourced from Spain. It is a nice favour and is REALLY slow to grow, bulb up, mature and then dry and cure. It has a fantastic clove colour and nice full complex taste. You can see in the photo that the stalks are not fully dry yet and this is 6 weeks after harvest – although I do keep the long stem on these creole varieties usually till fully cured – these were trimmed down for the photo. It takes several months for it to fully dry out and cure. The heads are not particularly large but they do seem pretty consistent in size and have very clean skins. Its one that I want to keep trying to grow in bulk. 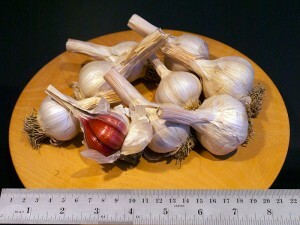 I have taken to growing a large bunch of random unnamed garlics. It’s mainly because either I have lost the names for them and got them mixed up OR just have no idea where they came from and what they are – so I throw them into the ‘Mixed’ plot. There are quite a few soft necks mixed in with them as well as the hardnecks. I think It’s good to keep testing out new bulbs for local growing and suitability. There seems to be a lot more interesting varieties out there in the markets than listed in most books. You never know what you are going to get and many seem to grow quite differently in different locations. 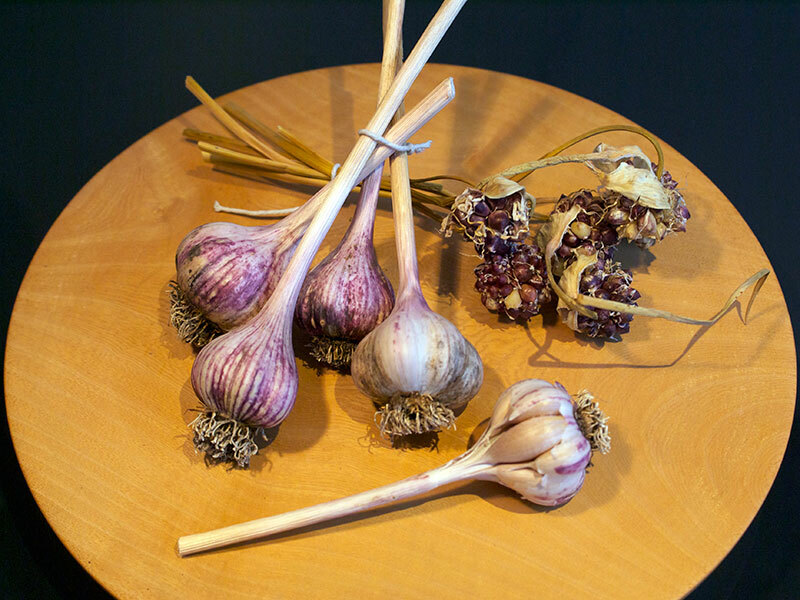 I will compulsively keep a clove or two from any garlic I pick up that seems to have unusual or interesting characteristics. I have to include a nod to ‘Giant Garlic’ or more correctly Wild leek even though it’s strictly not a garlic as it’s such a good reliable producer every year. Some people just love it. I think it’s worth growing too if you have some space. 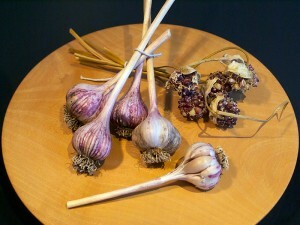 Here’s how I dry a lot of the garlic by hanging it on loosely knotted strings in a shed/garage space. It works well and is quite quick to fully dry the larger heads. The light levels stay quite low despite the transparent roof and the humidity sits very low down at about a max of 25%. Its useful to have a digital thermometer for keeping track of the temperature and humidity levels. 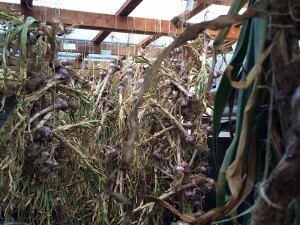 Both ends of this building open up fully so the air can flow freely through around the garlic. I also use wall shelving with open grated racks or trays to dry them on. It all works very effectively. Although tying and hanging it all is not possible when you are growing thousands of them, using a mixture of drying and curing methods for the different varieties and spreading the harvest out over a few weeks seems to keep things manageable. Don’t plant the bulbs in too closely in rows where you can’t reach between them to weed. Best to have gaps between several rows at a time for easy access. Don’t let the weeds grow too big – pull them as soon as they appear. Pulling them when they are larger can disturb the garlic roots. Don’t plant where water collects – especially in early summer – the soil needs to dry out a bit towards harvest time and the damp environment will cause all manner of fungus, rot and other problems the rest of the time and especially if moisture levels are too high on the upper leaves of the plants. 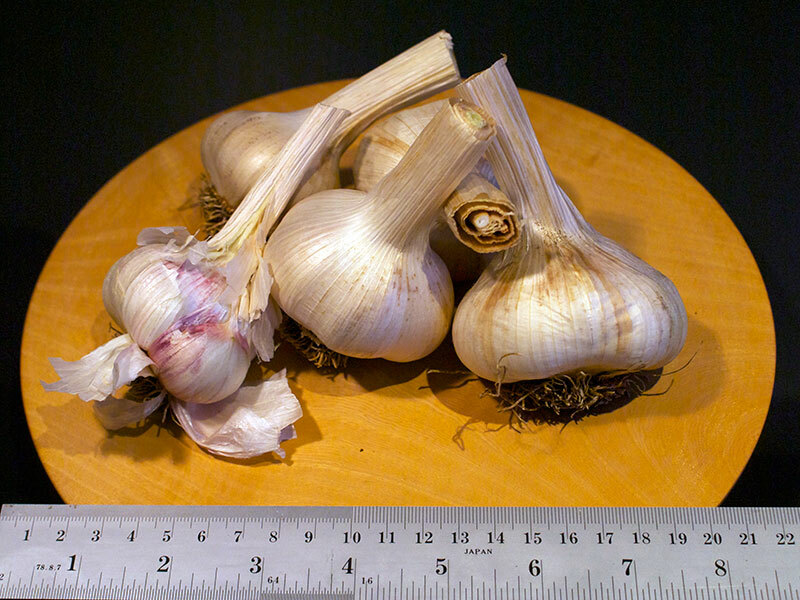 Don’t shade the growing bulbs or crowd the root growth with other plants. Don’t let the soil dry out till it’s nearing harvest time. 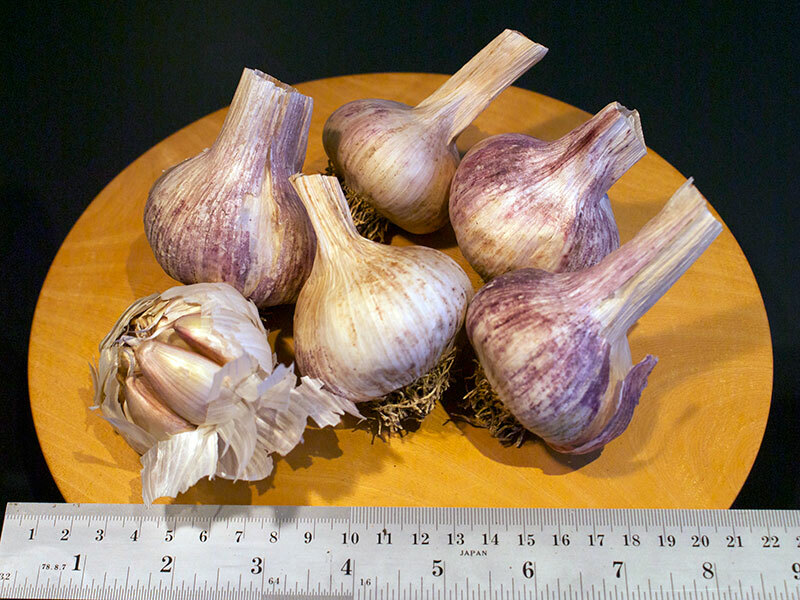 Don’t pull the bulbs till they are fully formed and the first lower leaves start to dry out. 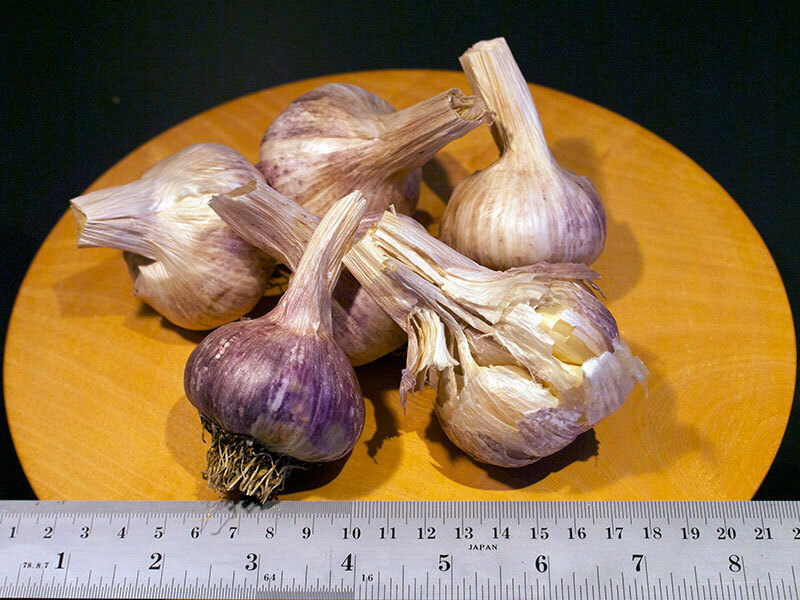 Don’t harvest by pulling the plant top unless you are growing in VERY loose soil. 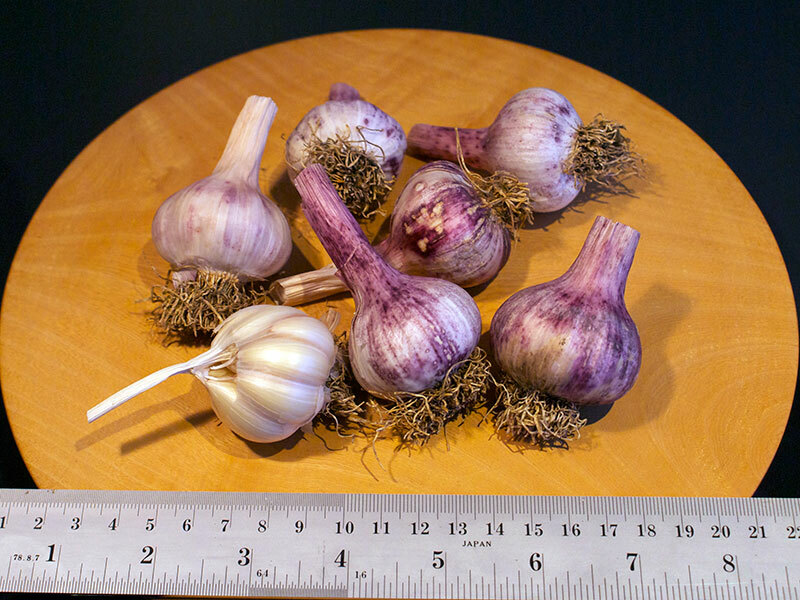 Don’t leave the harvested bulbs where they can get direct sun for longer than a few minutes if you can avoid it. Don’t bump. 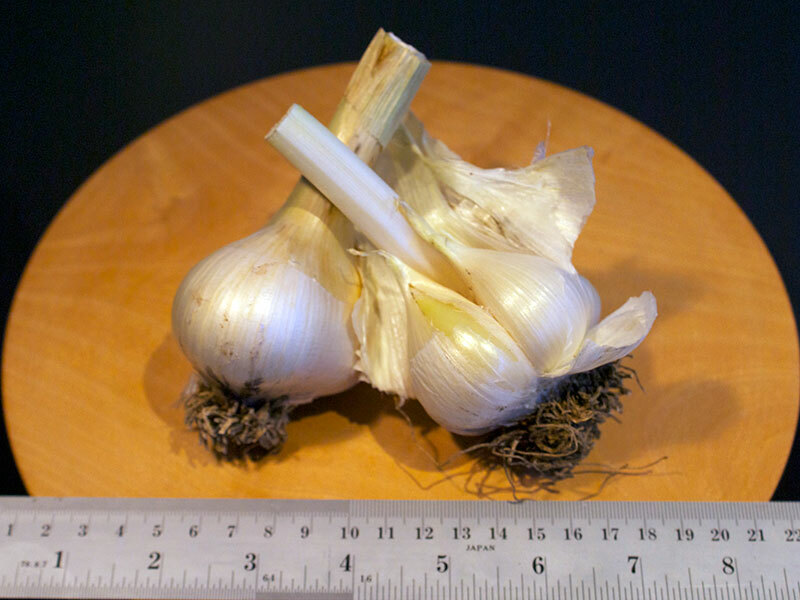 knock, throw or drop the harvested bulbs as they damage internally really easily. Do use significant natural soil improvements such as legumes and other green crops that you can turn into the soil before planting. Having a well prepared, deep, rich and open textured soil is much more important than adding fertilisers etc. later. Garlic responds very slowly to additions. Do use a fairly thick mulch to help retain moisture in the soil and keep weeds down. Using Lucerne straw especially will also help improve the soil a lot. Sugar cane mulch is useful if it’s a wet season. Do plant early rather than late to get as long a growing period in as possible. Do make sure there is adequate water right through the growing season. Letting the plants dry out will retard growth really quickly and likely make for ‘rough’ and multi stem growth bulbs especially if it’s early in the growing process in late winter. Do plant them in the open and in full ‘all day’ sun. Do get them in the ground and let them get cold weather in autumn and winter – they will grow roots and send their first leaf up as soon as you give them some cold weather and some moist soil. That initial germination period is critical to the eventual quality. 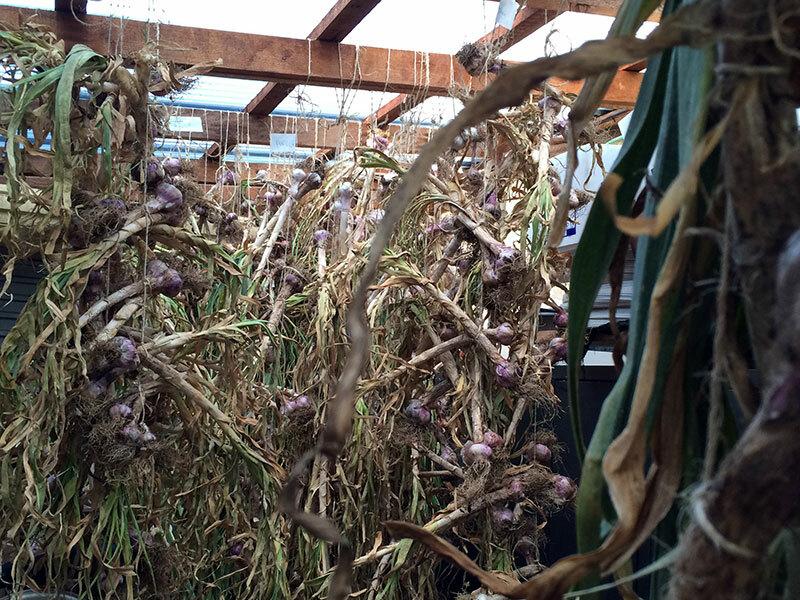 Do make sure when you harvest the bulbs that they get lots of free air movement in a dry space. 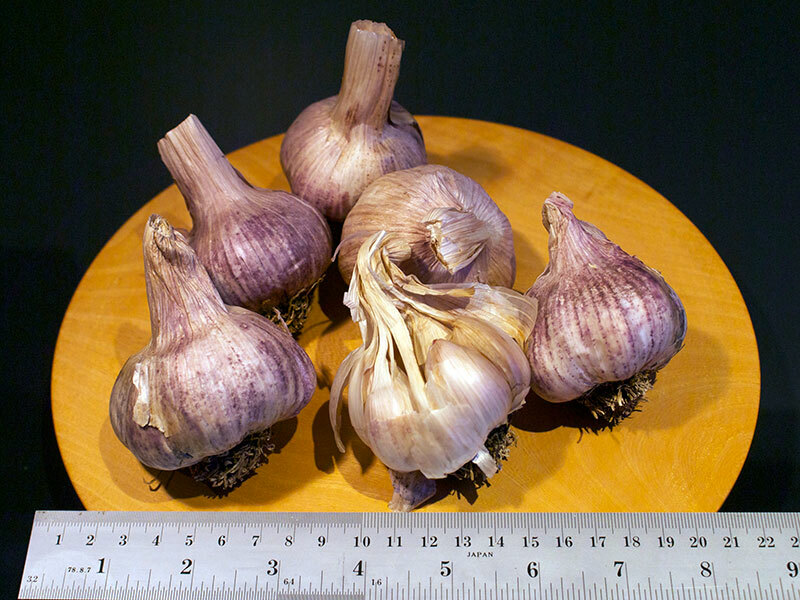 Do clearly label the plots of bulb varieties when in the ground and then when harvested so you know what they are. 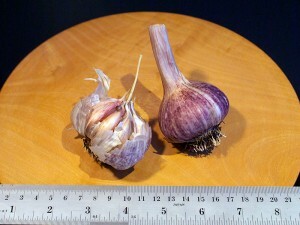 And do try and plant them in blocks where similar varieties are not too close to each other so they can’t get mixed up. Do check the bulb development under ground as some varieties mature and bulb up much faster than others.